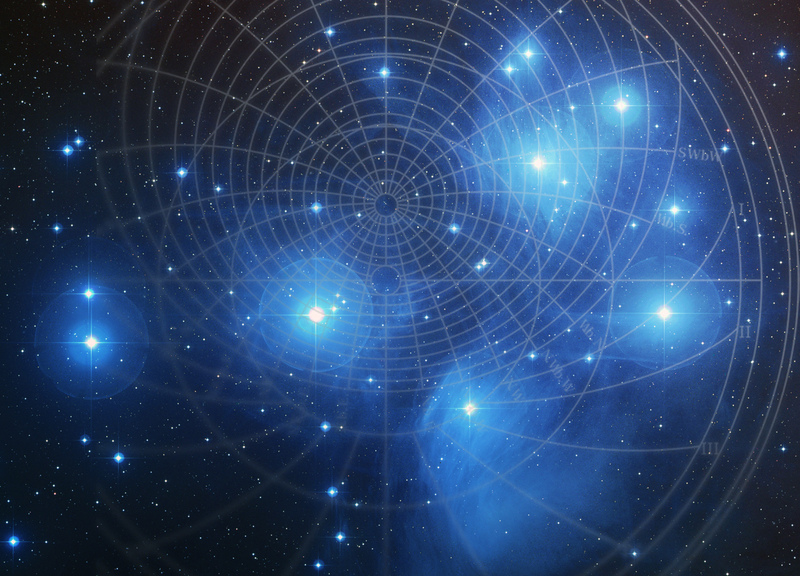 This article has first been published in German by the Meridian Fachmagazin fuer Astrologie and in English by the Infinity Astrological Magazine. Until the invention of the telegraph and later the telephone, obtaining reliable and consistent information about a ship’s safe arrival in the harbor of destination was difficult and required much time. At the time of Columbus, when ships were frequently used to discover new parts of the world or more convenient trade routes, family members or assurance companies could only get information about missing ships from other vessels which crossed them on their route or met them in a harbor. Often, the only notices were news reports from second and third-hand sources, which were not always reliable. This is why chapters on “rumors” are so extensively treated in ancient astrological texts, as are those on “safety of ships”. Assurance companies had their own web of harbor-based information offices, to collect details on the fate of people, merchandise, and the ship itself. Since the ships normally followed established routes, they were in some way traceable, and the alarm was given when they did not reach the scheduled destination in a certain time frame. But other ships, such as those bound for the Americas or uncharted destinations, could not always cross a checkpoint, and the news might be delayed for many months or fail to arrive at all. In the worst case-scenario, the lack of reassuring report was due to the loss of the ship; other times it was just a problem of time and distance, or problems caused by pirates. Consulting a skilled astrologer was the only means of trying to get some kind of information and was used by family members, ship owners and assurance agencies alike. Ship owners used astrological advice when deciding whether to insure their ships in some kind of option trading. Depending on the risk that the ship could be entirely lost (shipwrecked) or partially lost (damaged by bad weather, suffering loss of all or part of the merchandise/passengers, or attacked by enemies), they needed to pay high sums to assurance companies and expose themselves to a double economic risk: the costs of arming their ships and the assurance fee, which sometimes cost nearly the same. Assurance companies naturally had a vested interest in obtaining as much news and information as possible when deciding whether to insure the ship or not. As commercial activity always depended on transport, one of the main tasks of ancient astrologers was to analyze if a ship had arrived at destination safe and sound. These techniques, which applied for nearly 2000 years for ancient transport mediums, have proven to still apply today, regardless of whether referring to a train, a cruiser, or an airplane. This is because in astrology’s symbolic language it doesn’t matter, if a vessel is moved by rudders or an engine. In order to understand how to associate angles, signs or houses to modern vehicles, it is necessary to understand the underlying logic of the older attribution of the ship’s parts. Ancient astrologers used to attribute every part of a ship, its crew, and captain to a specific part of the chart. There are two main systems of reference: the first, and older one, is based on the angles, the second on the Signs. While the second system is similar in main ancient texts, the first presents some apparent incongruities. The first system, represented by astrologers such as Dorotheus, Hephaistion, and Al Kindi, have the parts of the ship associated with the axes and the houses. While the mast was commonly associated with the tenth house and the belly with the Imum Coeli (IC), not all astrologers agreed with the attributions of the prow and the stern of a ship. 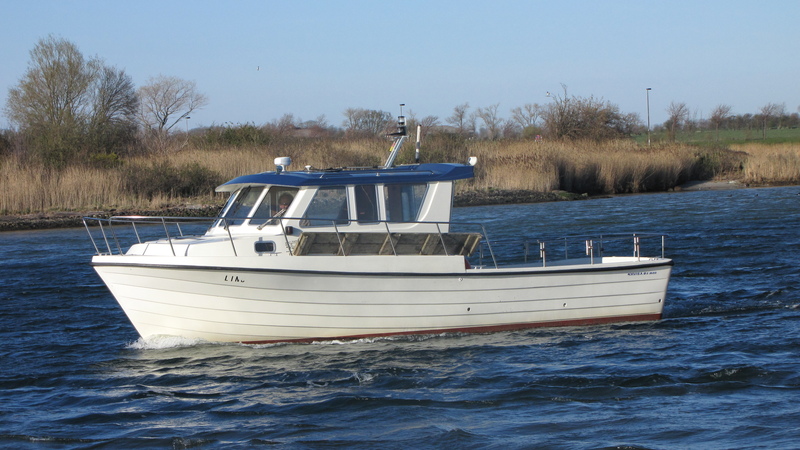 The “prow”, nowadays usually called the “bow”, describes the forward part of the hull of a ship, the point that is usually most forward when the vessel is under way, in other word, the ship’s “head”, whereas the “stern” referrers to the back or aft-most part of a boat. While al Kindi gives the first house to the prow and the seventh to the stern, Hephaistion does the contrary. On the one hand, the seventh is usually envisioned as the destination of a journey. In that case, Dorotheus imagines the ship sailing away from home (the AC) into other waters (seventh) while al Kindi imagines the ship returning to home (the ascendant) (…). According to Ben Dykes, the attribution of the prow/stern’s association is thus linked to the direction of the ship. He suggests that it might depend on the kind of horary that the astrologer has been asked. In the question “Will the ship reach its destination?”, the prow would be associated with the seventh house, while in the question “Will the ship return home”, the prow would be associated with the first house. Personally, I’m not convinced of this because ancient astrologers refer to a consistent and liable system of astrological symbolism which was not “reversible” depending on the question, but based on logical associations. So the reason for the differing attributions of prow and stern might be found elsewhere. Traditionally, the head of a person is described by the first house and its ruler. The head contains the brain, which governs the nervous system and from where decisions are taken and impulses are given to the rest of the body. This is why the head was always associated with that part of a ship where the direction was decided. 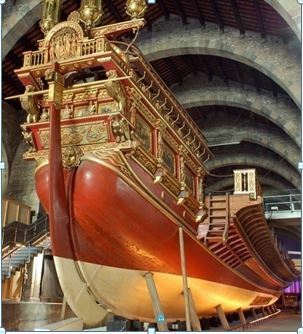 The image on the right illustrates a typical late Roman Trireme, similar ships were still used in the 8th Century, and the above mentioned authors may have had these models in mind. 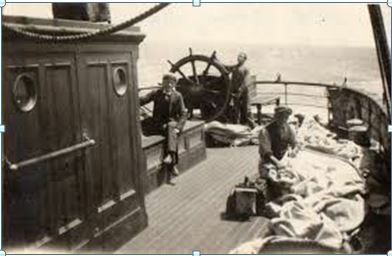 The captain’s place is on the left in the picture, in the stern of the vessel, protected by a tent and an overhanging wood structure. Etymologically, the term ‘stern’ to describe the rear end of the ship, comes from the old Norse word stjōrn, meaning “steering”. All ancient ships were built with the commando bridge in the back of the ship, independently of their country of origin: the Egyptian barka, Phoenician vessels or later Spanish Galleons were constructed with the same principle. The stern was the place of the command. In the (as far as we know) older system, the associations of the parts of the ship are based upon their astrological symbolism: Dorotheus/Hephaistion gave the stern (the place of command of the ship) to the Ascendant, the most powerful angle in a chart. In this, they draw a mental picture from the real places on a ship: power (= stern) left, direction (=prow) right. This makes clear, that the 1st house is associated not so much with the engine (rudders or else) but with the place from which the direction is controlled. It’s the captain’s place, but not the captain himself. The captain was thus looking towards the destination he decided to take but was standing in that direction the ship was leaving, as shown in the picture . 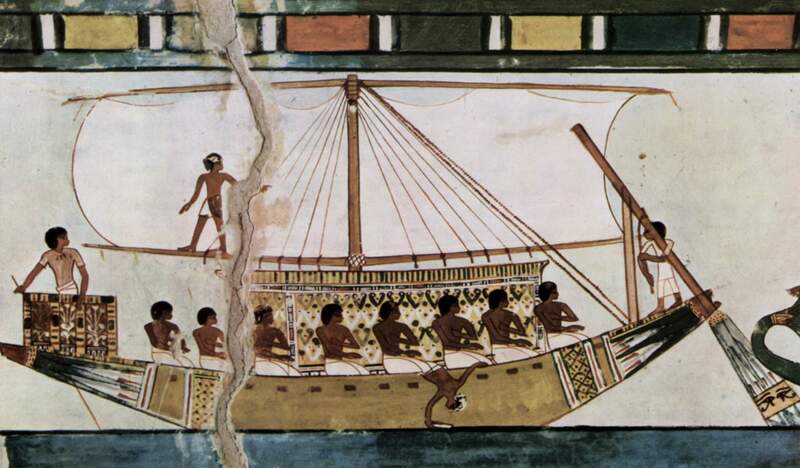 Al Kindi, representative of the second system, might have considered the ship more functionally: The prow was the strongest part of the ship, that part which the Romans used to face their enemies and pull them down. The prow was to “open” the waters and make the ship find its way through the waves, as can be seen in the Phoenician Bireme with its tooth-like front (Fig. 6). The word ‘prow’ derives from the Greek word prōra, meaning “forward-facing” or “in front”. Also spelt prou in medieval English, the same word acts as the root of the word “proud” and is traditionally used as an adjective to mean “valiant”. Nowadays, many boats  and ships have their navigation bridge in front of the ship (prow). In this case, al Kindi’s and Hephaision’s associations of the prow probably would agree. The logic of the angles is adaptable to modern airplanes, where the cockpit (brain of the airplane) is ruled by the Ascendant and the bottom by the IC while the Medium Coeli (MC) describes the heaviest place, which is the end of the airplane, where the rudder and the vertical stabilizer are positioned. This rudder is also the highest point of the aircraft. Following this logic, the wings are attributed to the DC. Authors like Ptolemy, Al Rijal, and later Lilly, associated the parts of the ships with the Signs. These associations followed a logical system which was also used for the human body. Since traditional astrologers described all parts of a ship in detail, as a result it is easy to adapt them to modern transport mediums, too. Aries is associated with the head and the nervous system. In the ship, it governs the prow. Ancient (war)ships had either a battering ram on the prow, in Italian called “Ariete”, or at least carved prows. These were often in the shape of dragons, and animals associated with Aries ruler Mars, the God of war (Fig. 7). Those animals were believed to ward off evil spirits and sea monsters. to the 18th century (to which Lilly might have referred) had a beak head, a protruding part of the foremost section of a sailing ship, which served as a working platform for sailors working the sails of the bowsprit, the forward-pointing mast that carries the Mast. That mast is still called “Marsstange” (Mars mast) in German and shown left in the fig. 8. In airplanes, Aries governs the cockpit. From here the decision is taken in which direction the plane will fly. Taurus refers to what is under the breast and a little under the water, this is from the prow to the water. Thisis thus indicating that part of a ship which is directly under the beak head. It is no wonder that especially in the 17th century this part of the ship was richlydecorated as shown in fig. 9. These decorations were in later times treated as expensive artobjects (Taurus is ruled by Venus). In the modern airplane, Taurus reflects the big throat of the aircraft under the cockpit. Gemini governs the rudder of the ship, corresponding to the yoke or control command in the airplane, as well as to the rudder, a directional elevatorand ailerons that control pitch and roll. Cancer is associated with the bottom or floor of the ship, while it refers to the outer bottom of the aircraft. Leo is given to the top of the ship, the “bridge”; in the aircraft it’s the passenger’s cabin. Virgo is associated with the belly of a vessel, comparable with the cargo deck of the aircraft. sometimes below the water. If we consider the stern (navigation bridge) associated with Aries, Libra describes the prow. Figure 10 shows an example of luxurious decoration (Venus). In the aircraft this sign perfectly describes the wings (double bodied air sign), which keep the aircraft in balance. Scorpio describes, according to Umar, the place of the mast, while Lilly associates it with the facilities of the sailors, which seems appropriate as in the old ships the toilets were close to the mainmast and the prow. (Scorpio is close toLibra, the prow). Lilly attributes Scorpio to that part where seamen are lodged. Looking at drafts of old ships, it becomes evident that both opinions are right: The sailor’s lodges were under the prow, close to the bathrooms and under the main mast. In an aircraft, Scorpio describes the bathrooms (usually close to the cockpit and in the back part of the plane) and the places used for preparing the refreshments, inaccessible to passengers. Sagittarius, according to Umar, is associated with the Mast, which might best reflect its astrological symbol of a bow. Sagittarius is a bicorporal sign, reflecting a few masts. Lilly says it is referred to the sailors.Today we might also associate the flag of the ship’s origin with Sagittarius, which is run upon the mast. Capricorn is associated with the ropes, sail and yardarm (Umar). In its astrological glyph is a hint to a cross, reflecting the yard arm. 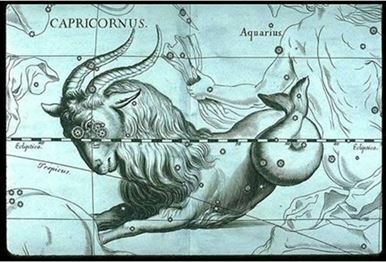 Capricorn is the modern denomination of the ancient sign of the goatfish, which was considered half goat, half fish and links thus water with earth. Since Capricorn is placed between airy Aquarius and a fiery Sagittarius, it might have been considered a connecting sign between the four elements. As it is ruled by the heaviest planet (Saturn), it mirrors the mast as the weightiest element on the ship (earth) and that place on the other part (Cancer) entered most deeply into the water, its keel. This seems logical, if we consider Capricorn the natural ruler of the 10th house, the highest place in a chart. If we also consider the upper part of a chart as that part of a ship, which is above the water, Capricorn is literally in the middle, as the main mast is. Nevertheless, Lilly associated Capricorn with the end of the ship, which fits only if we consider Capricorn as the third from last sign, describing the last part of the ship. From a technical point of view, the ship could not be heaviest in its back part, because the ship would have been unbalanced. 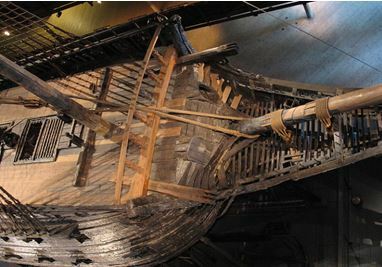 The cargo was to be equally distributed and in ships, but due to the mast, the heaviest part was the center of the ship, just under the main mast. Personally, I find it more fitting to use Capricorn as the last part of a vehicle in the case of an airplane where there is no “elevated part”, but in the case of a ship, the gigantic mast seems to be appropriately described by that sign. It seems as there were two layers to associate parts of a ship with the zodiac. One is strictly linked to its pure symbolism (heavy mast= ruled by heavy planet), (or the highest part of the ship= highest part in the chart), the other is linked to the sequence of the signs in the zodiac. This means that Capricorn, being the third from last sign, necessarily ruled the posterior third of the ship. In astrology every planet, house or sign has many significations. When defining a certain place on a ship, or organ in a body, for example, different signatures in the chart must lead to one more concrete definition. In this Capricorn might describe either the mast or the last third of the ship, depending on the rest of the chart context. Aquarius is given to the sailors (Umar) or, by Lilly, to the captain.As that sign is close to Capricorn, which describes (according to Lilly) the last part of the ship, and the captain’s place was in the stern of the ship, this makes sense. Aquarius, a human sign, is the diurnal domicile of Saturn and describes symbolically the most influential person board, which carries the responsibility over ship, passengers and cargo. By analogy, in an airplane Aquarius perfectly describes the pilot, surrounded by his technological instruments on board. Pisces governs the feet in the human body, which correspond to the oars in the ship while the association in the airplane is with the landing gear..
Mars indicates split, drowning or running aground of the transport medium if Mars is in an earth sign and in any of its essential dignities. If it is in a Fire sign, it describes fire. If a benefice casts a sextile or trine to Saturn or Mars and to the lord of the angles, especially the AC, and the dispositor of the Moon is free from impediment, then the transport medium will have many problems but the “greater part of it” (both ship and passengers) will survive. If Mars afflicts the lord of the angles and the dispositor of the Moon, it shows enemies such as pirates or modern hijackers. If there are other afflictions (for example, combustion or the presence of the Dragon’s tail) it shows bloodshed. If Saturn afflicts the lord of the angles and the dispositor of the Moon, it shows thefts. The Sun rules life. Finding it under the horizon takes its light away and might indicate death. The Moon describes the follow up of events; her position under the horizon describes the ship to be “under the water”, that is, wrecked. These planets oppose to the interest of the AC (ship) and the AC ruler (passengers) and are thus considered as “open enemies”. The Dragon’s tail describes the Moon’s apogee or the farthest point from the earth, this is a harmful place and considered malefic. The interpretation of two chart examples will help to understand these rules better. They will show the reason of the specific disaster and what special roles the captains had in it. The Italian cruise ship Costa Concordia capsized and sank after striking an underwater rock obstruction close to the Island of Giglio, Tuscany, on January 13th, 2012, with the loss of 32 lives. The ship, carrying 4,252 people, was on the first leg of a cruise around the Mediterranean Sea, starting from Civitavecchia in Lazio, Italy, when it deviated from its planned route, coming closer to the coastline, and struck a rock formation on the sea floor. On February 11th, 2015, after a trial of more than eighteen months, Captain Francesco Schettino was found guilty of manslaughter of 32 passengers and sentenced to 16 years in prison. I always work with the time of the scheduled departure, as this is a most certain and already contains, in my opinion, eventual delays. House System: Regiomontanus. Malefics: Mars is in a succeeding house and in an earth sign while Saturn is close to the 4th house angle. The Moon (ship) is applying to a conjunction with Mars (accidents). This becomes even more important if we consider that at the precise moment of the crash (chart shown below) Mars is conjunct Moon on the AC. The importance of this Moon-Mars conjunction is further underlined in the natal chart of Captain Schettino, discussed later on. 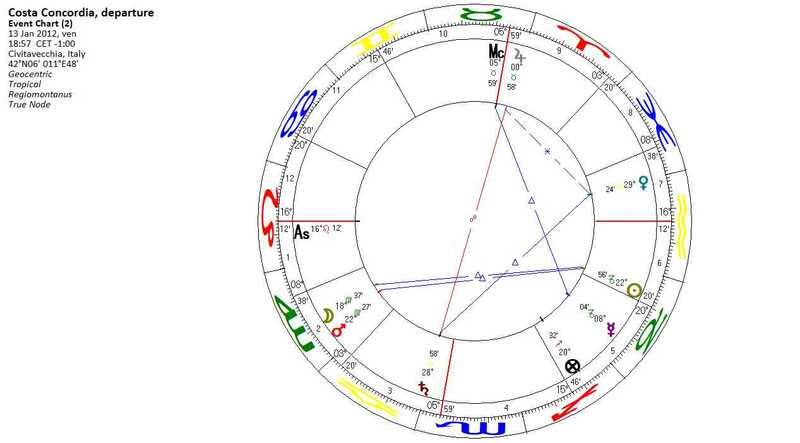 Benefics/angles: Turning back to the departure chart, we find Venus is in an angular house, and has recently separated from a trine with Saturn. She is leaving her current sign, moving toward her exaltation. Venus rules one of the angles (MC), while Saturn disposes of the other, but the malefic is ruled by Venus. The position of Venus was probably the reason that most of the 4,200 persons survived. Jupiter is only 5° from the 10th house angle. On the MC it offers help, but doesn’t rescue the situation because it suffers the accidental affliction of being the 8thhouse ruler; and has moved to the 8th house at the time of the crash. Luminaries: Both luminaries are under the horizon, but in one of their dignities, while the Sun (passengers) is exactly trine Mars, dispositor of Pars Fortuna, indicating that the loss of people will not be total. 8thhouse ruler: 8th house ruler Jupiter is prominent by its elevated position on the MC. It receives a trine from Moon’s dispositor Mercury and is going to be squared by AC ruler Sun. Dragon’s tail: In the departure chart, the dragon’s tail is inconspicuous in the 11th house..
Lilly associated the body of the ship with the AC and the Moon, while the passengers are identified by AC ruler, here theSun,, so Leo and the Moon do represent the ship, while the Sun describes “those who sail in her”, including the captain and crew, as well as the passengers. The Moon is approaching Mars, a violent planet and symbol of accidents. It rules the 9th house of travel and the 4th house which represents the tomb or end of things. This house is particularly associated with drowning of men and sinking of ships. An accident during the travel will be the end of the ship. The position of the Moon-Mars conjunction in the 2nd house points to a massive loss of resources.Wikipedia reports that Costa Concordia has been officially declared a “constructive total loss” by the insurance company, with her salvage expected to be “one of the biggest maritime salvage operations. The Moon is dignified in her triplicity, which indicates that the ship was not entirely sunken, indeedthe photos of the cruisers laying onits side and half of it under the water, have travelled all around the world. The ship’s navigational bridge is located in the prow (as in main modern cruisers), and thus given to the AC, according to Al Kindiand Lilly.It follows that the right part of the ship is described by the houses 12,11,10, 9, 8,7 and planets therein, whereas the left side of the ship is described by the houses under the horizon. The ship is nearly exactly wrecked on its right side. Saturn naturally describes rocks and in travel charts ground running and leaks, while Libra is descriptive of hilly places. Libra is a bi-corporal sign, describing “more than one”. Concordia approached too much the three Le Scole rocks (symbolized by Libra), and struck one of them which opened a 70m hole. Saturn is in the 3rd house, indicating communication problems. The coast guard had been alerted too late (and not by the captain but by the passenger’s mobile phones), while the ship was already sinking. Victims could have been avoided if the alarm was given earlier. Aquarius, the diurnal domicile and human sign of the weightiest planet of the solar system (Saturn) is traditionally used as the main significator of the captain. Aquarius rules the 7th house, reflecting opposing interests between those of the captain and those of the ship. Venus (natural significator of women and love affairs) and Neptune (unrealistic perception of things) are positioned here. The Sun, as the center of the solar system and analogously representative of that person who rules the ship. 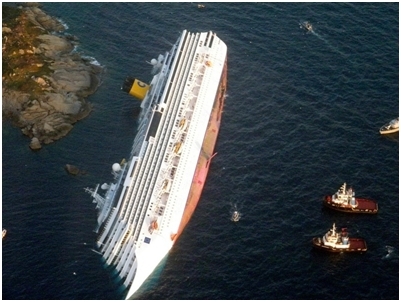 Placed on the cadent 6th cusp at the time of departure, it describes Schettino to be inadequate or not trustworthy. The planet has moved to the 5th cusp at the time of the crash, showing Schettino to be too preoccupied by entertaining pleasantries, rather than taking seriously the safety of his ship. The Sun-Mars trine describes the easiness with which Schettino (Sun) caused the accident (Mars). Approaching the coastline so closely, Captain Schettino wanted “greet” the island, showing his illuminated ship in the night sky, while he was conversing with a woman who was staying without authorization with him on the navigation bridge. As Saturn is exalted, Schettino’s behavior can be seen literally: he was excited, not taking seriously the risk and his responsibility for the ship, and the 4,200 people on board. But the planet is about to leave its sign(and exaltation): Schettino left the ship as a thief and was accused of abandonment of the ship. While doing so, he (Saturn) approaches the 4th house (ground), where the story of Costa Concordia dramatically ends. The biwheel reproduced above shows the event chart of the crash (inner wheel) and Schettino’s Natal (noon-)chart (outer wheel).We can see the Moon/Mars conjunction of the crash conjunct his natal Moon and trine the Sun at 22° Scorpio. 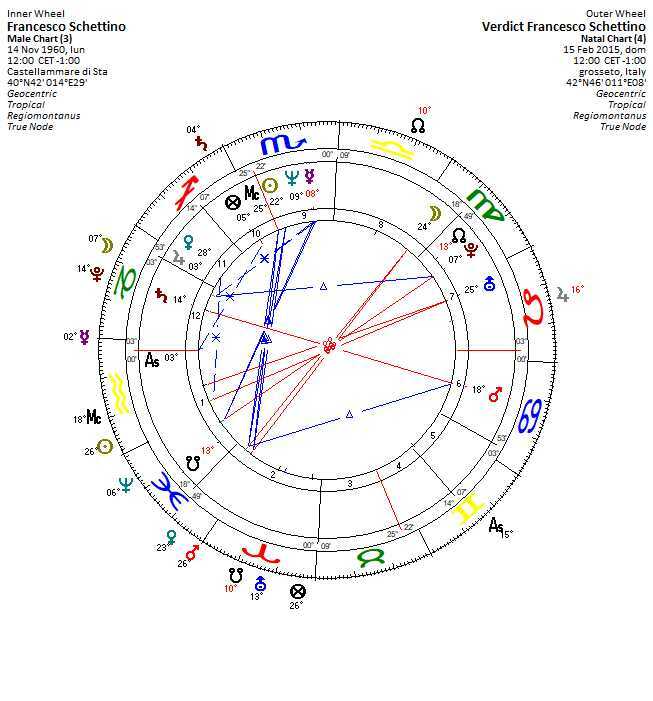 His (peregrine) Sun is in the 3th house of the event chart:he was conversing and showing the board instruments to the woman while his natal Mars, in the fall (erroneous actions)casts a perfect sextile to the AC (ship) and is in applying sextile to the Mars/Moon conjunction (accident). Schettino has a Saturn-Mars opposition by birth, so self control and action are blocking one another. Once he realized his mistakes, he was not able to govern the situation and took flight, abandoning his ship. 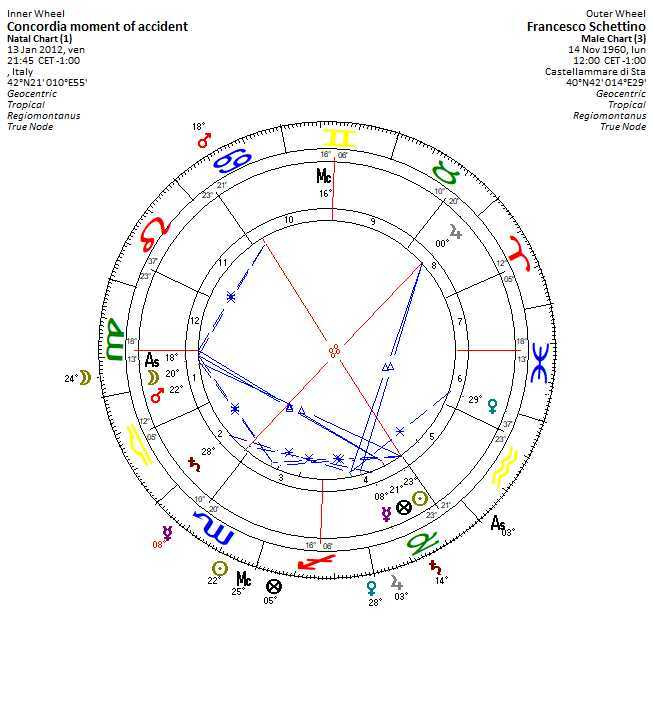 When Schettino was convicted (Feb. 11th, 2015, chart below), Pluto (public indignation, personal annihilation) was in exact conjunction with his natal Saturn (responsibilities), with the transiting Moon in aspect to that axis, whilst Mars, at 23° Pisces opposes the position of the Moon-Mars conjunction (accident) in the event. The chart shows the scheduled departure time for Flight 9525 which take off at Barcelona–El Prato Airport on 24 March 2015 at 10:01 a.m. CET (09:01 UTC) with nearly half an hour delay The aircraft was due to arrive at Düsseldorf Airport by 11:39 CET. The aircraftcrashed 100 km northwest of Nice, in the French Alps, after a constant descent that began one minute after the last routine contact with air traffic control and shortly after the aircraft had reached its assigned cruise altitude. All 144 passengers and six crew members were killed. The crash was deliberately caused by the co-pilot, Andreas Lubitz. Having previously been treated for suicidal tendencies and being declared “unfit to work” by a doctor, Lubitz kept this information from his employer and reported for duty. During the flight, he locked the captain out of the cockpit before initiating a descent that caused the aircraft to crash into a mountain. Malefics: Saturn is exactly conjunct the DC and thus in opposition to the AC, whilst Mars is in a cadent house. Benefics/angles All the angle-rulers are afflicted: Jupiter (DC) is retrograde in the 4th (grave), Saturn (MC) is a malefic and rules the 8th and is retrograde, Mercury (AC) aspects Pluto and is going into combustion and the Sun (IC) is applying to a conjunction with the Dragon’s tail and trines Saturn. Both benefics are also afflicted: Venus is in a cadent house while Jupiter is slow and retrograde, angular but moving backwards from the 4th angle.While there is no aspect to the malefics from Venus, Saturn is separating from a trineto Jupiter. The dispositor of the Moon is heavily afflicted, without aspects from the benefics. Luminaries: The luminaries are not under the horizon, but respectively in the 11th and 12th house. Indeed, the airplane did not come down (under the horizon) but crashed nearly horizontally in the mountains. Still, the ruler of the 10th house is positioned in a cadent house and under the horizon, whichis quite descriptive of the altitude “falling” down. Lord 8th: The Lord of the 8th (death) is casting an exact trine to the Sun (end of things). Opp. AC : The ruler of the 8th is opposite the AC. 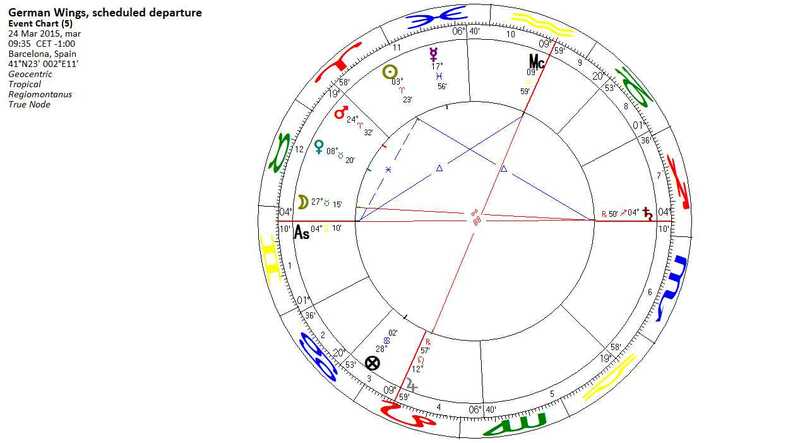 Dragon’s tail: In this chart, the tail is not in one of the indicated houses, but close to the Sun (grave) and disposed by violent Mars, ruler of the 12th of hidden enemies. The body of the aircraft is represented by the AC in Gemini, while the passengers are described by the AC ruler Mercury. The planet is both in its fall and detriment. It’s also leaving a sextile with Pluto in the 8th house of death. Mercury’s next aspect (already in the following sign) is the combustion with the Sun, which represents the 4th house, the “earth” and the tomb. The position of Mercury in the 11th house, which is traditionally considered fortunate, is of no help here; because its ruler Jupiter is retrograde in the 4th.The next aspect is a square with Saturn, ruler of the 8th of death. There is no reception between Saturn and Mercury, describing vividly that there were nosurvivors.The Moon is in the 12th house of self-destruction and hidden enemies. She’s in her exaltation, but leaving that sign. Her next aspect, already in Gemini (and disposed by Mercury-Lubitz), is a square to the Sun, representative of the tomb and immediately afterwards an opposition to Saturn (death). As we have seen, the rule of the captain is associated with Aquarius, Saturn’s daily domicile. Lubitz, the second officer, locked the door whilst the captain(Saturn) was in the bathroom and after coming back; the captain was not able to enter the cockpit. He had to stay out or go “away”, which is accurately described by Saturn being retrograde.The planet describes the captain as powerless: it is angular but peregrine, still in duty, but powerless. Classical literature gives no hints on second officers, but Lubitz was the colleague of the captain, his business partner, supposed to replace him when necessary. For this reason I’d associate the ruler of the 7th house from Saturn’s position in the chart as being descriptive of Lubitz. As Saturn is in Sagittarius, its opposite sign is Gemini and thus Mercury does describe Lubitz. Following this logic, Mercury is descriptive of both, passengers and second officer. This makes sense as he carried them to death and shared their fate. Mercury is heavily afflicted and peregrine. 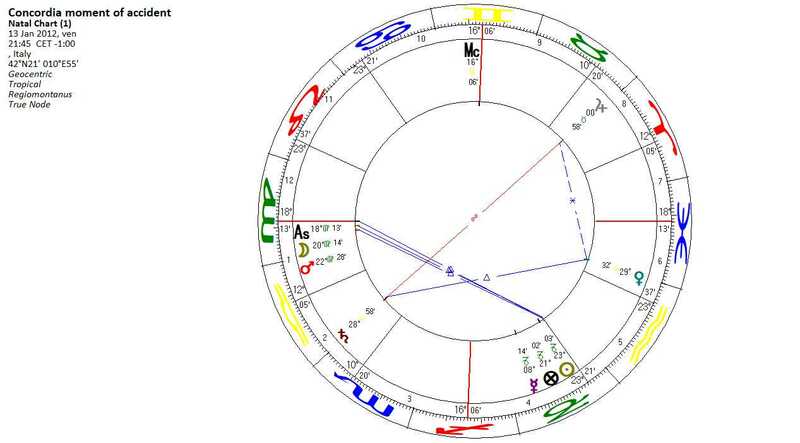 It has left a square to Saturn in the 6th house, denoting health problems. The ruler of the 6th house is Venus; she’s in the 12th house of mental problems and self undoing. That house describes depressions. Venus in her own sign points to the head. The second officer was mentally ill, which is also shown by the (already separated) aspect with Saturn, as Saturn-Mercury aspects depict a disturbed mind and a suicide tendency. This second system must have derived from the angle based system, following its logic. Dorotheus of Sidon, Greek astrologer, author of “Carmen Astrologicum”,1st Century AD. Hephaestion of Thebes was a Hellenized Egyptian astrologer, who wrote a Greek trataese known as the Apotelesmatics, around 415 AD. Abū Yaʿqūb ibn Ishāqal-Kindī , ( 800 – 873 B.C. )was an Iraqi Muslim astrologer, philosopher, polymath, mathematician, physician and musician. The Book of the Nine Judges,translation by Ben Dykes, Cazimi Press 2011, p. 521. This association seems more relevant if the DC is associated with Libra, a bicorporal air sign. Only in later times the prow was decorated with wonderfully elaborated foreheads, such as sirens and nymphs. In The logic of al Kindi’s system shows to be reliable: the AC –stern (Aries) governed the ship while the prow in Libra was decorated with feminine figures. Abû Hafs ‘Umar ibn Farrukhân Tabarî (815 BC), was a Persian astrologer and architect. As Capricorn seems more appropriate to describe the main mast, Sagittarius might describe the two secondary masts, usually present on ancient ships. Also consider the symbolism of Christ’s birth around the winter solstice and the symbol of his death, the wood-cross. Capricorn, as one of the four equinoctial signs, reflects on axe of the ship. As it is the most elevated sign, it necessarily describes the highest point of the ship. Since Saturn is a male and diurnal planet, it is’ considered more powerful in a diurnal sign than in feminine nocturnal Capricorn, which is why Aquarius and not Capricorn describes the captain. Pisces (Oars) and Capricorn (sails) are in sextile aspect; one helps the other or may substitute it in case of absence or wind (or rowers). The rules refer to the departure chart, but the chart for the moment of accident is given for further information. Jupiter is the ruler of the 8th and not considered as benefic in this case. CA, p. 398. See also that the dispositor of Fortuna (Mars) makes no aspect to Mercury (ship as a value). Indeed, the ship was to be scraped. The south node is prominent on the MC during the accident. We can also consider the AC, as a point in time, approaching a Sextile with Saturn. Traditionally, the stronger malefic is considered the “cause o accident”, while its house position and sign ads details. According to Wikipedia, the accident happened at exactly 21.45 GMT, 2 hours and 45 minutes after leaving the harbor of Civitavecchia. Libra is associated with the Lymph system. If we associate the 4th with the keel and Saturn with the rocks under it, it does not surprise that the rock opened the ship like a tin on both sides. Saturn is also at the end of its sign, pointing to some kind of wall or division. Traditional astrology only considers those planets which are visible to the naked eye.